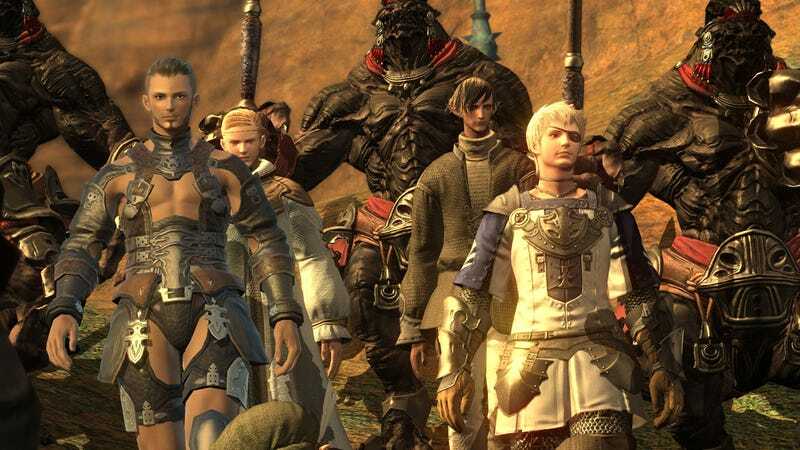 On this, the eve of the official launch of Final Fantasy XIV: A Realm Reborn, let's take a look back at the original release of Square Enix's second Final Fantasy MMO, and reflect on the wrongs the new version is trying to right. Forget Cloud, Squall, Tidus, and Lightning; in Square Enix's second massively multiplayer Final Fantasy game, you are the hero. And so is everybody else. Many massively multiplayer online role-playing games use war as a backdrop. Final Fantasy XIV drops players into one of Eorzea's three city-states after fifteen years or so of uneasy peace. Planning for a war that never happened has left countless soldiers and mercenaries without work. To handle this problem, the idle combatants formed guilds to help re-purpose their out-of-work compatriots as adventurers. The message to new visitors to this fantasy realm is quite clear: Get a job. Massively multiplayer online gamers with the time, patience, and inclination to carve out their own little corner of the Final Fantasy universe with several thousand like-minded individuals. The single-player Final Fantasy games guide players through an established story. Final Fantasy XIV is an opportunity for players to create their own. Is this just an updated version of Final Fantasy XI? Final Fantasy XIV shares certain aspects of Square Enix's first massively multiplayer Final Fantasy title, but like any two of the single-installments, the mechanics are very different. Instead of leveling up a single class at a time, players can switch between any number of professions by simply swapping tools of the trade. Swapping your axe for a doming hammer, for example, changes your profession from Marauder to Armorer. Each profession gains ranks, while at the same time the player gains experience points that increase their physical level. By the end of testing, I was a level 19 character, a rank 12 Marauder, a rank 11 Blacksmith, and several other professions. It sounds quite complicated. There isn't much to Final Fantasy XIV that isn't complicated. Mining for ore has the player performing a hot-and-cold mini-game. Synthesis (read: crafting) involves maintaining a balance between quality and durability, using colored lights as an indicator of how successful the next action will be. There is no recipe book in-game, so players must consult external websites to figure out what they can make in the first place. Crafters set up shops all over the place, but with no method in place to search for sale items, I found myself spending hours clicking on random strangers, hoping they were selling what I needed. The game's complexity is further aggravated by a lack of in-game documentation. Some thrive on the challenge of conquering the game's mechanics. I just found myself getting frustrated. Check out the FFXIV MMO Logs for my four weeks as a pink-haired kitty girl named Fritti. Isn't there a PlayStation 3 version of the game on the way? It's glaringly evident to anyone attempting to navigate Final Fantasy XIV's cumbersome interface that the PC version is the PlayStation 3 version. There are currently no convenient keyboard shortcuts for simple actions like opening up your inventory or assigning your skills. Those aren't the sort of buttons you'd find on a PS3 controller, so why have them? Instead players must open a main menu to access inventory, statistics, abilities, and any number of functions that would be better served by a simple button press. Many players, myself included, feel as if paying PC players are beta testing the console game instead of playing a fully realized product. So it's a total loss then? The game does have its redeeming qualities. The combat is relatively simple, and the ability to mix-and-match skills from your different professions makes for a level of character variety not often seen in an MMO. It's also a breathtakingly beautiful game on a high end machine, filled with nifty little graphic touches like leaves blowing in the wind. Plus, Square Enix recently extended the free subscription period from 30 to 60 days, laying out plans to enhance the game based on player feedback, adding new functionality like the ability to search player stores and a button that targets the nearest enemy. Tell me more. Our Final Fantasy XIV MMO Log, which covered four weeks of gameplay, from character creation to blacksmithing to an extended pancake metaphor, touches on the finer aspects of the experience. They say a journey of a thousand miles begins with character creation. There are chocobo in Final Fantasy XIV, but you cannot ride them. The whimsical, lemon-yellow, ostrich-like franchise mascots are installed at stables in the game's main cities, but players cannot interact with them. Square Enix hasn't determined how it's going to implement them in the game. I can see how Final Fantasy XIV could evolve into an amazing online experience. All of the elements are in place, but like the chocobo, Square Enix is still trying to figure out how to make them work. Many players may have the patience to wait and see how things pan out. I do not. Final Fantasy XIV was developed and published by Square Enix for the PC, released on September 30. PlayStation 3 version due out next year. Retails for USD$49.99, with a starting monthly subscription rate of $12.99 a month for one character. A copy of the game was given to us by the publisher for reviewing purposes. For a detailed accounting of the four week's spent playing Final Fantasy XIV for this review, check out our Final Fantasy XIV MMO Logs.